Science-based climate targets: What are they? Science-based targets are like crystal balls—you can use them to see into the future. More precisely, they’re a window into a more climate-compatible world. On December 15, 2015, world leaders—alongside businesses, non-governmental organizations, and other non-state actors—gathered in Paris to agree to limit global warming to 2˚C (with a stretch goal of 1.5˚C). The resulting Paris Agreement established an important threshold, set by science, to help society avoid dangerous and costly climate change impacts, such as extreme weather and sea level rise. This means putting less greenhouse gases—the principal heat-trapping agents that cause global warming, such as carbon dioxide—into the atmosphere. Today, the world emits more than 30 billion metric tons of carbon dioxide equivalent (CO2e) per year into the atmosphere. Tomorrow, this figure will change. Some argue it will rise, given business-as-usual practices. Others argue it will decrease, as policy action ratchets up decarbonization to adhere to the Paris Agreement. No one can predict the future perfectly, but the International Energy Agency (IEA) has developed some of the best thinking on what a decarbonizing world could look like. IEA’s “2 Degrees Scenario” paints a technological pathway through 2050 and beyond of a world avoiding a breach of the 2˚C limit. In 2050, according to the IEA, a 2˚C world would emit less than half the carbon emissions it emits today. Put simply, science-based targets are meant to align companies with the vision of a climate-compatible future. Specific targets that companies set will depend heavily on the sector. For example, the carbon-intensive power generation sector will have to divorce itself from its greenhouse gas footprint more forcefully than, say, the industrial sector. Even within sectors, targets will vary greatly by industry, whether we look to cement, shipping, apparel, food, home appliances, or something else. 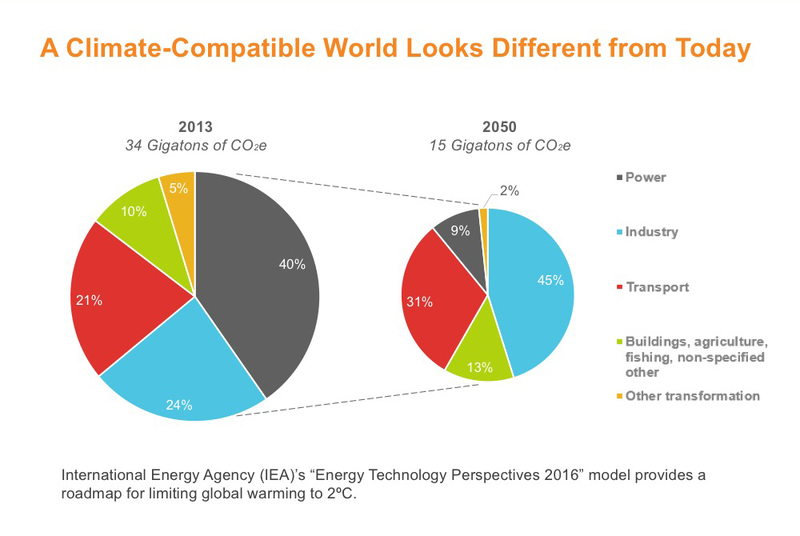 The IEA presents one possible scenario of a climate-compatible tomorrow, but other legitimate scenarios exist as well. Moreover, these scenarios will likely change over time. Science-based targets will invariably depend upon the scenario that’s chosen. Despite these complexities, science-based targets all do the same thing: They align company ambition with a climate-compatible world, which brings us back to the original thesis. Science-based targets can simply be thought of as a window into the future. This future is fundamentally bright because it reflects a development pathway consistent with climate science and the broader sustainability agenda. In short, it’s a future worth fighting for. Business is accelerating its uptake of aggressive targets that concur with climate science. As of this blog’s publication date, more than 170 companies have signed up with the Science Based Targets Initiative (SBTi)—a joint venture of heavyweight civil society players championing the movement—to set and implement science-based targets. Of those signatories, 20 have already verified with the SBTi that their targets are indeed science-aligned, including Dell Inc., General Mills, NRG Energy, and Procter & Gamble Co. Late last summer, General Mills announced ambitious science-based targets, which cover its massive upstream agriculture footprint. The company vowed to cut absolute greenhouse gas emissions by 28 percent across its entire value chain—from farm to fork to landfill. BSR helped General Mills develop the strategy for setting this watershed target. What were the drivers for General Mills and other leading companies to commit to science-based targets and that continue to build momentum for the broader science-based targets movement today? Now that we have a better sense of what science-based targets are, let’s explore why companies are adopting them. In my next post, I will expand upon the business case for setting science-based targets.